I’ve written here about McDonald’s many times. I really, really love this company and, yes, I love the food. Admittedly, I can’t eat at McDonald’s as often as I would want to sometimes, because my will power has a really hard time making the healthier choices they offer. For example, my favorite breakfast from McDonald’s is an Egg and Cheese Biscuit and a hash brown. Yummy, right? The fact is, though, if I enjoy this breakfast while I’m watching my calorie and fat intake, I really, really have to eat a barebones-style diet for the rest of the day, because that contains around 500 calories, with about half of that from fat. Plus? It doesn’t fill me up all the way until lunch. Yet I still love it. Oy vey, what’s a girl to do? The scoop on this cup o’ goodness? 290 calories, with only 40 from fat (That’s less than 20%, if you’re doing the math). PLUS, 5 grams of fiber. Now, you might protest about the sugar content. Yes, this oatmeal as served has 32 grams of sugar, BUT you can ask for it to be made without the brown sugar, and that will save you a whopping FOURTEEN grams of sugar (taking it down to 18g), nearly half! 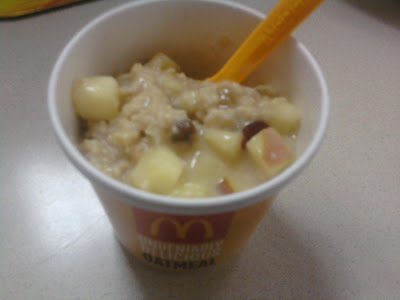 All I know is, this is my new favorite breakfast at McDonald’s, and to be honest, I didn’t see anything EVER taking down my old favorites, so I’m a happy camper. Go try it out: it’s quick, inexpensive, and you don’t have to clean up your kitchen after you eat it! Disclosure: I was provided with two coupons to try this oatmeal for free, with no expectation of a blog post at all. All words and opinions are mine. I am SO SO SO glad that you reviewed this because I have been thinking about trying it but was wondering if it was a.) good and b.) somewhat healthy for me. Previous post: PSA: I’m Making A Name Change.